HR software so you can focus on the people, not the paperwork. Onboard a new employee, send & collect documents, or easily manage time off. Easy to start. Easy to use. Easy to love. Hire new employees within minutes, not days. Just fill in some basic information about the new hire, choose which documents that need to be completed, and send the offer letter. No more printing out paperwork packets, or following up with new hires for information you need to collect. New hires can onboard digitally within minutes. Imagine instead of starting your first day with a stack of paperwork, you can review your offer letter, and complete all your new hire paperwork within minutes online. GoCo can make that happen. Your team’s data accessed from a single place. GoCo helps you get organized around your team’s data, empowering you to do more with less time. Collect custom fields, send a document to a department, or keep track of time off balances. Your existing documents, with a touch of magic. Upload all of your existing offer letters, agreements, handbooks and other documents. 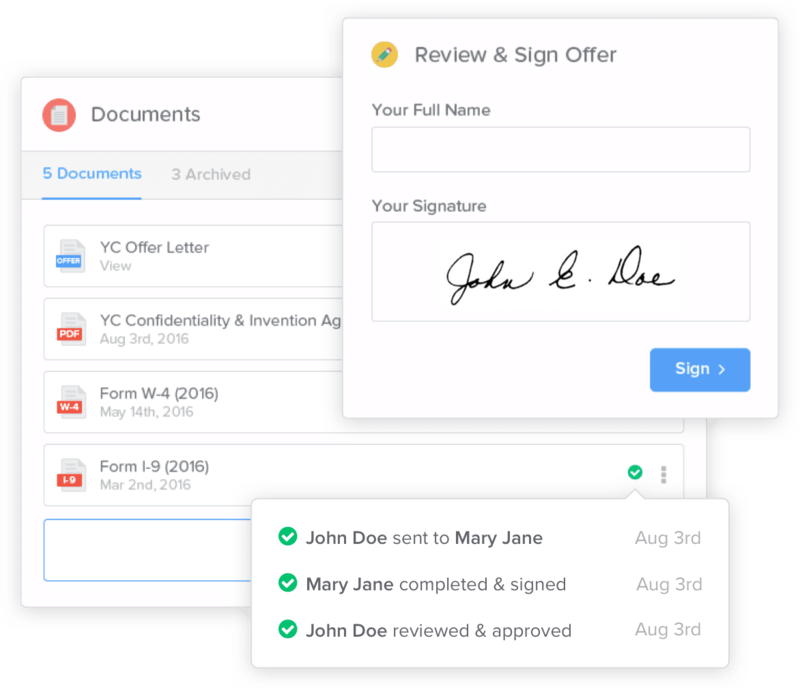 GoCo let’s you turn your documents into Magic Templates that can be automatically filled in with your team’s data. No more chasing down paperwork from your team. Everything can be sent, signed and organized in one place. Give your team an easy way to request time off and have their managers approve it. GoCo automatically keeps track of accruals, max balances and all other aspects of your company’s PTO policy. No more spreadsheets, no more hassle. Everything is kept in sync with your existing payroll. There’s no need to switch the payroll provider you know works for you. With GoCo’s Payroll Sync, all changes made in GoCo can be synced over to any online based payroll. Bring your existing benefits + broker and leave the paperwork behind. Benefit enrollment can be a complex and messy hassle. GoCo simplifies all of this by implementing all of the benefits your company offers, and letting your team enroll online. All the enrollment information is aggregated and synced to the insurance carriers. Join 1000+ other companies using GoCo to streamline their HR department. Most amazing part is managing the benefits. Employee can play with different options to know their premium details, easily available plan details. This has simplified my work life, and significantly reduced the number of hours I spend on human resources. Everything is in one place, and our team is able to make changes to their information, without me touching it. One stop source for employee on-boarding, HR information, and benefit information – previously was scattered across multiple systems. We’ve gained a ton of capacity on our team by not having to manually process so many issues. I love the fact that not only does it integrate with our Slack platform – it is very comprehensive as far as managing our HR systems. It keeps our team organized – we can see benefits, documents, vacation and other time off requests in one place. It makes our new employee onboarding a breeze! Explore more areas where GoCo can help streamline how you manage your team. 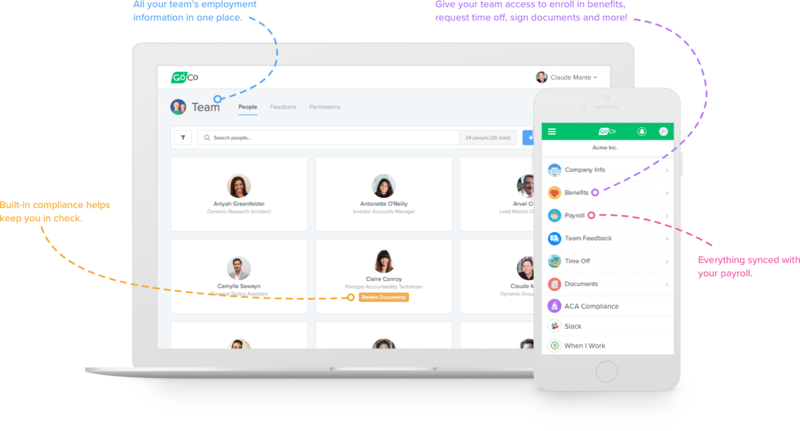 GoCo brings everything you need to handle your HR and benefits, so you can focus on your team and company. Simple as that! Connected with the apps you know and love! 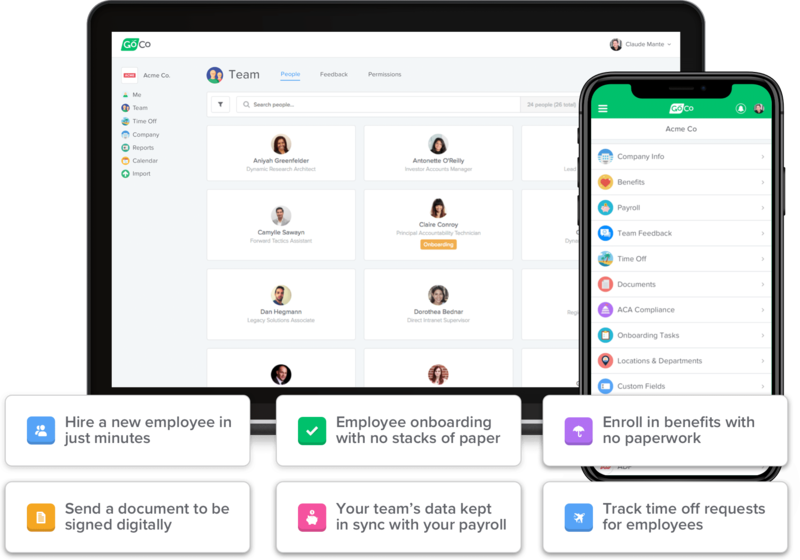 No more keeping your favorite apps in sync with your HR. GoCo integrates with several industry leading apps to keep your HR truly connected. Quick and easy! We’ve partnered with the best in the HR and Benefits industry to give you direct access to the stellar support and expertise you and your team deserve. See how GoCo can simplify your HR! Our mission is to make operating a business easy, and to empower companies to take care of their employees. Let us show you how GoCo works!